We prefer you to book directly with us, click the book now button to book instantly. Come with us and let our cameras be your eyes in and around our sumptuous accommodation. Let our photo gallery be your guide; see for yourself the luxurious experience available at La Haule Manor. Our standard and superior rooms, plus 2 luxurious suites are elegantly furnished with personal finishing touches. It gives us great pleasure to welcome you to La Haule Manor, our luxury Guest Accommodation and Self Catering right on St Aubin's Bay in Jersey. The Manor, with its stunning Georgian façade, dates back to 1796, and has been lovingly restored and tastefully decorated for you to enjoy today. We are pleased to have a 5 star rating from Jersey Tourism. Step inside and enjoy a décor inspired by a bygone era; high ceilings, freestanding baths, chandeliers and plantain shutters add to the charm and elegance of our accommodation. Our accommodation has an emphasis on relaxation, comfort and luxury. 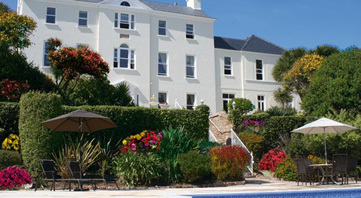 Start your stay with a complimentary glass of bubbly on our terrace or in our beautiful lounge with stunning sea views. Our personal and friendly, relaxed service starts when you arrive; we are on hand to help you with anything you may need during your time with us. Our close proximity to St Aubin's village - just a few minutes walk along the seafront – makes our location ideal for foodies. There are over a dozen restaurants to choose from, including Indian, French, Italian and Chinese cuisine. Also nearby is our sister hotel, La Place, where you'll find the award winning Retreat Restaurant with its charming, elegant but informal surroundings. So that you can enjoy a perfect and relaxing dining experience, we will give you a complimentary luxury transfer to and from dinner. Accommodation comprises of 8 standard rooms, 6 superior rooms and 2 suites. All rooms have all the 'mod cons' you need to make your stay comfortable including free WiFi, flat screen TV with Freeview as well as tea and coffee making facilities, plus extra touches like The White Company toiletries. Our 2 Self Catering apartments are fully furnished to give you a 'home from home' experience. They are serviced daily and include The White Company toiletries, bathrobes and pool towels. A welcome pack of essentials including items from the Lucas Brothers farm shop directly behind us is included for your arrival. We look forward to welcoming you and helping make your stay as relaxing and enjoyable as possible. We have a fleet of Luxury vehicles available to which we offer a collection and drop off service to guests who book directly with us. We also offer transport subject to availability on the day to local restaurants and different trips are available subject to season/numbers which can be booked when you arrive with us.